CONSIDERING how much at variance he was with the predominant theology of his day, it’s fairly amazing that so many people today would consider Tyndale’s theology so excellent on so many points: on justification and sanctification; on which books are canonical; on the Lord’s Supper; on vernacular Scripture; on theology’s need to be practical and down-to-earth; on his concern for the poor and his conviction that the corruption of riches had sidetracked the church from its true spiritual role; and on several others. Even though during his own day the religious establishment branded him a heretic of the vilest sort and his views those of Antichrist, his views have now been adopted by a large cross-section of the church. But whose views was he touting? Acknowledging that all theologians’ views are shaped by their own life experiences and acquaintances, who or what shaped Tyndale’s theology, against the grain of the religious establishment, into one we would likely applaud today? Because, unlike with Martin Luther, we know little or nothing about Tyndale’s family, childhood, readings habits or teachers, it is difficult to say for sure. By concealing so much of his life from the authorities of his day, he left very few traces for historians. Thus it is not easy to know what shaped his thinking. But there are several very likely influences that history tells us about. A major force in the late 15th and early 16th centuries was the Renaissance; by the time Tyndale translated the New Testament into English, this wave of change was crashing across the entire European continent. It brought changes in art, in government, in economics, in literature, in learning—it even changed the way men thought about themselves: it stressed man’s ability to think clearly and behave morally, and said that man could and should press to achieve new heights in every field of endeavor. Called “humanists” because of their emphasis on humanity’s potential, these people were tired of the hyper-spiritualized logic and fatalism that had previously dominated theology. Additionally, they opposed the reigning scholasticism, which assumed that everything needed to be divided and subdivided to be understood. These rising Renaissance scholars had become exasperated by teachers and leaders seemingly content to do nothing but create new terms and have semantical arguments about them. They longed for a new world order based on the achievements of the Greek and Roman civilizations; hence they valued the original sources of Greek and Latin literature. They longed for the day when educated men could pursue truth in peace, without arousing religious or nationalistic reactionism. Naturally, they were also critical of many of the abuses of traditional piety. Renaissance literature contains many satires about the failings of the church and the immorality of the clergy. Although when Tyndale attended them the universities of Oxford and Cambridge were just beginning to be affected by elements of “the new learning,” he is almost certain to have been one of the students most attracted to their nascent forms. The groundwork was well-laid. Not too long before Tyndale came to Oxford, the scholar John Colet had sought to avoid the nit-picking of scholasticism and had aroused quite a stir simply by lecturing on the biblical text. Unlike other lecturers, he did not cite what the authorities said about the text; he straightforwardly quoted what the Bible itself said. Only a little later at Cambridge, Desiderius Erasmus was establishing his reputation for Greek scholarship and study of the Bible in its original languages. Such men were still a minority at that time—as evidenced by the hostility they received from their conservative fellows—but a change was in the wind. Exactly how much Tyndale was affected by such emphases is difficult to say, but somewhere he acquired a masterful knowledge of the biblical languages, as well as a disdain for obscurantism. He expressed his disgust with the Oxford doctors who argued passionately about the comparative moral benefits of virginity and widowhood, and, during his stay at Little Sodbury Manor, translated Erasmus’s Enchiridion Militis Christiani into English. Later he used the Dutchman’s Greek New Testament to prepare his own English translation. Undoubtedly he benefited from, and was apparently eager to use, the dictionaries, grammars and other linguistic tools that Renaissance learning was inspiring for the translation of Greek and Hebrew classics. However, Tyndale was not so influenced by Renaissance thinking that he moved to the anti-supernatural, human-idolatry extremes of some Renaissance men. He denied that the Bible’s writers were merely duplicating ideological systems already established by pagan thinkers, or that pagan philosophers’ ideas had somehow crept into the Bible and irremediably distorted whatever truth it contained. He stressed the fundamental authority of Scripture. Also, he was critical of Erasmus and others who advocated reforms but continued to identify themselves with an apostate church. He was greatly disturbed with Erasmus’s duplicity, for example, in the all-important matter of Bible translation; how could Erasmus keep advocating vernacular translations while still supporting those Roman Church authorities who were burning Tyndale’s English New Testaments? When Sir Thomas More accused Tyndale of mistranslating the text, Tyndale defended his work by telling More that he had only done in English what More’s “darling Erasmus” had done in Latin! So Renaissance thinking was a significant, but not the entire, influence on Tyndale’s theology. A second major influence on Tyndale, a major influence of the whole era, was of course that of Martin Luther and the other reformers. And certainly these other reformers, including Zwingli in Zurich, Lefevre in Paris and Farel in Geneva, each made significant contributions to the movement of Reformed theology and practice that were transforming the face of religion in Europe. But Luther’s was probably the most widely-felt influence, and the one with which Tyndale had his closest encounters—though his actually ever meeting Luther cannot be clearly established. For Tyndale not to have been influenced by the Reformation would have been almost impossible. The whole of the European continent was in turmoil over it, especially the area today called Germany. Manifestations of the reforming spirit were everywhere, ranging from the irenic to the revolutionary. Most everyone talked about changing the church; some extremists, in the name of such reformation, turned to violence. In several parts of Germany, the peasants rose up against the rulers and were only put down by terrible bloodshed. And though Luther tried repeatedly to dissociate his cause from these events, words like Lutheran and Reformation had already been tainted. By the time Tyndale started writing his theological works, Luther had been leading the church-reform movement for about a decade. Certainly Tyndale must have heard about these events, and almost certainly he had opportunity to observe some of the results of Luther’s work during his visit to Wittenburg. From his translations and tracts, it’s obvious he had read some of Luther’s works and largely concurred with the contents of them. Some scholars have therefore concluded that Tyndale was little more than an English mouthpiece for Luther, a star-struck young radical who merely parroted his German idol’s ideas. This notion has a long history; in fact, it dates from the Reformation itself. Thomas More, for example, in his writings against Tyndale, frequently claimed that Luther was Tyndale’s “master.” And in many quarters of Europe in that day, this designation was anathema—but in few places more than in Henry VIII’s and Cardinal Wolsey’s England. The last thing Henry wanted was for his kingdom to be ravaged by “the German plague,” and he wasn’t alone; the English bishops were among the most conservative and anti-reform in all of Europe. Evidence of this is clear: whereas many European nations had vernacular Bibles well before the Reformation, England did not. England still maintained a law made some 100 years earlier that said translation of the Bible into English was forbidden on penalty of death. English churchmen of the period pushed for this law in an effort to thwart the Lollards, followers of John Wycliffe who had encouraged translating the Bible into the common people’s language. But any hopes of keeping the English isle isolated from the “heresy” were dashed with the clandestine arrival of Tyndale’s English New Testaments. Of course they came from Germany, where the “Lutheran devils” were prevalent and chaos was reputedly pandemic. Obviously, it was easy for English heresy-hunters to see Luther’s shadow looming just behind Tyndale’s. And there were many links between the two men. As Luther first translated the New Testament into German, then the Old, so did Tyndale with the English. In his biblical translations, Tyndale straight-out used some of Luther’s introductions and marginal notes. Tyndale defended Luther against the accusations of Sir Thomas More. Furthermore, the Englishman emphasized many terms that Luther had stressed, such as law, gospel, grace and faith alone. The most prominent evidence of Luther’s influence on Tyndale is that some of the passages in Tyndale’s polemical and devotional works are fairly verbatim translations from Luther’s writings. The second half of Tyndale’s meditation on the Lord’s Prayer (see “A Dialogue on the Lord’s Prayer”) is a very close translation of one of Luther’s meditations. Certain parts of Tyndale’s Introduction to the Book of Romans, (which was published separately from the New Testament), his Parable of the Wicked Mammon and An Exposition of Matthew 5–7 were also translated from Luther. However, it is easy to over-emphasize Tyndale’s dependence upon Luther. One should note that none of the works above were merely direct translation. In every one of them, Tyndale expanded, adapted and modified the original. Sometimes he even completely changed the sense of the original. One must also remember that Tyndale published approximately six other works that are in no way taken from Luther’s work. Moreover, on several important points of theology, Tyndale deliberately distanced himself from Luther. For example, while Luther taught Christ’s “real presence” in the wine and bread, Tyndale stressed the Lord’s Supper as a commemoration of Christ’s death. And while Luther expressed his doubts about the authority of the book of James, Tyndale declared that it definitely should be included in the scriptural canon. Tyndale’s theological independence from Luther can also be seen in his emphasis on the importance of good works in the life of the believer. The Englishman stressed that the Christian, prompted by the Holy Spirit and motivated by love, naturally produced good works. To illustrate this truth, he was especially fond of the biblical image of a tree producing fruit appropriate to its nature. Additionally, Tyndale wrote much more about God’s covenants and Christ’s promises than did Luther. And whereas Luther enjoyed music a great deal, both writing hymns and teaching Protestant congregations to sing, Tyndale was convinced that music tended to distract too much from the importance of preaching. To understand Tyndale as merely a translator of Luther is to do an injustice to the man’s independent mind. A third formative influence on Tyndale is not frequently mentioned in studies, but consideration shows it was nonetheless significant. Unquestionably, one of the shapers of Tyndale’s theology was his own English background and context. In whatever ways Tyndale was touched by the Renaissance and the Reformation, he synthesized these contacts through his mindset as an Englishman, very possibly of common stock, who was deeply devoted to his country and people. Unlike Erasmus, Tyndale apparently did not write for the larger world of international scholarship. He played no part in the numerous trans-national conferences intended to promote unity within the emerging Protestantism. He showed no desire to be linked—economically, politically or militarily—with any great goings—on outside of Britain’s isles. Rather, he wrote in English to all Englishmen about English concerns. Though his writing is rich in Scripture citations and allusions, which obviously made him a learned man, his writing style is precise, direct and down-to-earth—accessible to the common English people. He frequently employs similes, metaphors and illustrations drawn from the commoners’ everyday life. He speaks of, and to, the farmer, the weaver, the tanner, the shepherd, the housewife and the mother. He often quotes folk proverbs, revealing his confidence in the wisdom of the common man. The man or woman at the plow or loom could not have read, much less related to, the Latin literary works of Erasmus. But these people could understand and identify with every line from Tyndale. Just the fact that Tyndale wrote about God in English was extraordinary, for most Englishmen were told, and believed, that their language was too coarse to accurately express the delicate nuances of theology. Furthermore, many English clergymen believed that some theological topics were simply not the concern of laymen—nor most parish priests. 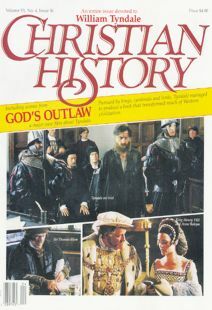 The social stigma against learning God’s truths firsthand was very strong: several times in the 15th and early 16th centuries, people were accused of heresy, imprisoned and even executed merely for possessing religious books in English or discussing religious topics in English. This official paranoia against religion in English was directly traceable back to the furor caused in the 14th century by the pre-reformer John Wycliffe, and his followers, the Lollards. These people too were very likely influences upon Tyndale. Court records from Tyndale’s era make it clear that Wycliffism had by no means died out. Lollard ideas were still around and germinating. Though Wycliffe had died nearly a century before, his ideas continued to trouble the church. And despite official hostility, Wycliffite groups continued meeting in private homes to hear the Bible read and preached. Such groups were linked by itinerant preachers. These preachers apparently used Wycliffe sermons that had been translated and simplified from the don’s tortuous Latin, then copied for distribution. Of course these secret gatherings, unauthorized preachings and contraband literature were strictly forbidden, but the people carried them on nevertheless. Many of these Wycliffite sermons are still extant, and in both content and style, they reveal numerous similarities to Tyndale’s works. Both appealed for the Bible to be released to the people in English, without any ecclesiastical glosses intended to mask the meaning of the text. Both assumed that the Bible could be understood in its literal meaning, without ecclesiastical assistance and without years of training. Both feared that the church authorities were intentionally trying to hide “God’s law” while attempting to impose “man’s law.” Both said that morality was essential for salvation, and that to know what God required man must have easy access to His law. Both said that those obeying God’s law would always be a minority, because the church was by definition the elect “small flock” among the larger mass who obeyed Antichrist. Both claimed that the church of Rome was poisoned by wealth, and both called on the king to discipline the church, thereby pushing it to fulfill its spiritual role. Although all the forces mentioned above certainly had some influence on Tyndale, altogether they still probably do not explain all the sources of his generally remarkable theology; the final sources we briefly suggest are Tyndale himself, and God. It appears clear that Tyndale was not a mindless slave to either Renaissance thinking, Lutheran thinking or Wycliffite thinking. In every case, he built upon what he saw as their strengths and discarded or opposed what he saw as their weaknesses. He said that by conscious choice, the greatest influence on his theology was Scripture, and thus God himself. Donald Dean Smeeton is associate dean of the college division at the International Correspondence Institute, a Christian correspondence university based in Brussels, Belgium. He is author of a historically ground-breaking work, Lollard Themes in the Reformation Theology of William Tyndale, published by the Sixteenth Century Studies Conference, and is serving as a consulting theological editor for the Catholic University of America’s forthcoming Tyndale series. Who was who in William Tyndale's world. Debate through the printing press.